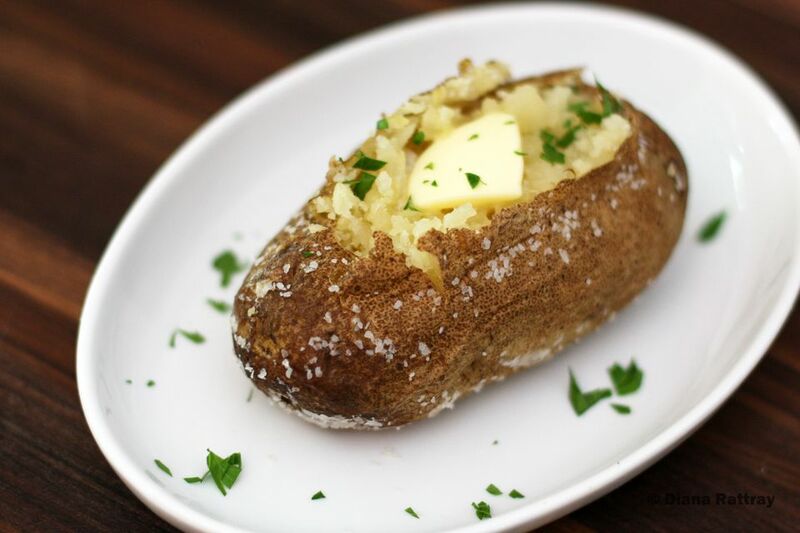 Follow this recipe and the basic instructions for perfect baked potatoes every time. Top these great baked potatoes with butter and sour cream, or sprinkle with parsley or chives. They're great with just about any meal, especially a meal with steaks or chops. Choose Russet, Idaho or other high starch baking potatoes for the best results, and scrub well to remove dirt and imperfections. Scrub the potatoes under running water to remove dirt; use a small sharp knife to remove imperfections such as cuts or small bruises. Use a skewer or sharp fork to prick each potato deeply in several places. This allows steam to escape while the potatoes are baking. Rub each of the potatoes lightly with olive oil and, if desired, sprinkle with or roll in coarse salt. Place the potatoes directly on an oven rack in the center of the oven. Bake for 60 to 70 minutes, or until the potatoes are tender and a fork will easily pierce the largest potato when inserted into the center. Remove to ​serving plate or individual plates and make a shallow cut down the center of each potato. Peel back a little of the skin on each and fluff a little of the potato with a fork. Serve with butter and sour cream, along with a sprinkling of chives, parsley, or bacon, if desired.​ Or top the potatoes with shredded cheddar or pepper jack cheese and return them to the oven to melt the cheese.